About GemLab: Incorporated in the year 2000, GemLab.co.in has attained pinnacle status in gemstone testing and its certification field over the years. However, the success of GemLab.co.in is not a mere coincidence, but it has achieved pioneer status in the gemstone certification industry with its rigorous hard work, continuous research and synergy with highly skilled professionals and industry insiders. 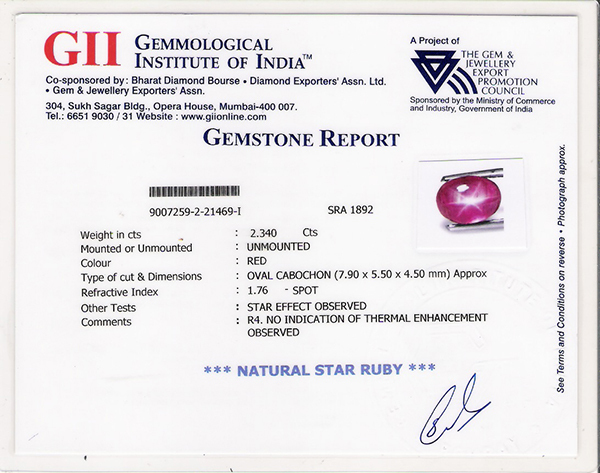 About GII: The Gemmological Institute of India (GII) is the first non profit research and educational organisation in the field of Gemmology in India. It is a public institution founded by the Gem and Jewellery Exporters' Association, Mumbai. GII is Government of India recognized as well as CIBJO recognized, and is at present the foremost gem-testing laboratory in India. About GIA: Established in 1931, the Gemological Institute of America is the world’s foremost authority on diamonds, colored stones, and pearls. The GIA Laboratory is the world’s most trusted name in diamond grading and gemstone identification. With facilities in New York, California, Bangkok, Mumbai, Johannesburg, and Gaborone as well as six international service centers, the GIA Laboratory is regarded as the world’s highest authority in gemology.